* Some systems fail to upgrade due to conflicts between systemd and the (now removed from the archive) systemd-shim / upstart. * Instead of trying to work out what's the problem in ordering / removal of diverts, ensure that systemd is never unpacked whilst systemd-shim/upstart are still on disk. Thus declare conflicts against systemd-shim/upstart packages in systemd package. * Check that it is possible to upgrade to bionic's libpam-systemd from xenial with systemd-shim installed on xenial, ie. * systemd-shim/upstart are both removed and not supported in bionic, thus forcing their removal via conflicts should bring the system into an expected state. After this operation, 71.7 kB disk space will be freed. Commenting out the dpkg-divert in systemd-shim's postrm solved this for me and I was about to continue the upgrade. The error complains that files will be overwritten, but this code runs in the systemd-shim postrm script, which is after systemd-shim's files have been removed from disk. What does 'dpkg -S /usr/share/dbus-1/system-services/org.freedesktop.systemd1.service' report in this situation? The system in question appears to work fine now, just the usual cleanup of changes for any major OS upgrade. contents and try to figure out where it came from. Thanks, that confirms that the file existed before the upgrade. I would still need a copy of this file to try to understand where it came from. That certainly matches the copy of the file shipped in systemd-shim in xenial. But I'm at a loss to explain why it's present on your system after dpkg has removed the package. dpkg-maintscript-helper rm_conffile /etc/dbus-1/system.d/org.freedesktop.systemd-shim.conf 8-4 systemd-shim -- "$@"
dpkg-maintscript-helper rm_conffile /etc/dbus-1/system.d/org.freedesktop.systemd1.conf 6-2 systemd-shim -- "$@"
I ran into this running a `do-release-upgrade -d` on a xenial machine at $work. The upgrade failed partway through leaving the system in a partial upgrade state afaict; lsb-release -a reports 18.04, but the apt sources are still xenial. I just ran into this during do-release-upgrade from 16.04.5 to 18.04.1 as well among other issues. The suggested mv solution worked. I ended up in a situation where some to-be-upgraded packages like network-manager-gnome were removed at first but never reinstalled, which turned out to be problematic, although I'm not certain it was this interruption's fault that apt somehow "forgot". I have tried with mine: bug #1787367. Okay, the usual update / upgrade runs through now, though what got was just the removal of the systemd-shim, and nothing else. feh and flowblade have been kept back. OpenOffice 6.0 (just as example) remains uninstalled. How can I know what else remains missing? The awk command lists a dozen of rather irrelevant stuff. Thanks anyway for the trick to remove the systemd-shim blocker! Notice the replacement has an extra .systemd on the end of the name. The fix instructions reported above worked for me. 0 aggiornati, 2 installati, 1 da rimuovere e 1 non aggiornati. È necessario scaricare 0 B/259 kB di archivi. Dopo quest'operazione, verranno occupati 652 kB di spazio su disco. Rimozione di "deviazione di /usr/share/dbus-1/system-services/org.freedesktop.systemd1.service in /usr/share/dbus-1/system-services/org.freedesktop.systemd1.service.systemd da systemd-shim"
Just upgraded today from 16.04 to 18.04 and I got the same issue. systemd-shim removed from the archive, so cannot be fixed really. Just upgraded my server from 16.04 to 18.04 and I also came across this error. > duplicate bug report (1792241). > the (now removed from the archive) systemd-shim / upstart. > systemd-shim/upstart packages in systemd package. > from xenial with systemd-shim installed on xenial. > 0 upgraded, 0 newly installed, 1 to remove and 0 not upgraded. > 1 not fully installed or removed. > After this operation, 71.7 kB disk space will be freed. > for me and I was about to continue the upgrade. > > duplicate bug report (1792241). > > the (now removed from the archive) systemd-shim / upstart. > > systemd-shim/upstart packages in systemd package. > > from xenial with systemd-shim installed on xenial. > > an expected state. > > 0 upgraded, 0 newly installed, 1 to remove and 0 not upgraded. > > 1 not fully installed or removed. > > After this operation, 71.7 kB disk space will be freed. > duplicate bug report (1793916). Accepted systemd into bionic-proposed. The package will build now and be available at https://launchpad.net/ubuntu/+source/systemd/237-3ubuntu10.8 in a few hours, and then in the -proposed repository. Similar experience on a DO instance. Initial do-release-upgrade failure due to bug #1793932: exim4 deprecated conffile issue. Now recovery is systemd-shim (9-1bzr4ubuntu1) blocked. @digitalcircuit's 2018-06-10 suggestion above did not work for me. Will restore 16.04 and try again later. 15 upgraded, 9 newly installed, 3 to remove and 389 not upgraded. Need to get 0 B/14.9 MB of archives. After this operation, 3,000 kB of additional disk space will be used. I'll try new solution in another pc. > hours, and then in the -proposed repository. I solved problem sttoping services and erasing systemd-shim upon console. CONFIRM: @digitalcircuit's 2018-06-10 recommendation works to complete do-release-upgrade from 16.04.5 to 18.04.1, after addressing exim4 issue. Accepted systemd into bionic-proposed. The package will build now and be available at https://launchpad.net/ubuntu/+source/systemd/237-3ubuntu10.10 in a few hours, and then in the -proposed repository. the (now removed from the archive) systemd-shim / upstart. systemd-shim/upstart packages in systemd package. from xenial with systemd-shim installed on xenial, ie. > duplicate bug report (1796221). > from xenial with systemd-shim installed on xenial, ie. > I'll try new solution in another pc. > > hours, and then in the -proposed repository. > > update out to other Ubuntu users. > > your testing we will not be able to proceed. > > advance for helping! > > -proposed for a minimum of 7 days. > > duplicate bug report (1796221). Is there any package available that fix this thing? > > I'll try new solution in another pc. > > > hours, and then in the -proposed repository. > > > update out to other Ubuntu users. > > > your testing we will not be able to proceed. > > > advance for helping! > > > -proposed for a minimum of 7 days. 0 upgraded, 5 newly installed, 15 to remove and 0 not upgraded. Need to get 147 kB of archives. After this operation, 77.6 MB disk space will be freed. Thus it should also cause removal of systemd-shim on upgrades. Marking as validation done. The upload of systemd that was purported to fix this bug report was superseded by a security update of systemd so the fix is no longer available. de nuevo, cual es tu consejo? > duplicate bug report (1787843). quieras perder y actualizarla a 18-04.
parciales. Primero a 16 y luego a 18-04. 18-04 tiene soporte para 10 años. > Muchas gracias por la información. > de nuevo, cual es tu consejo? > > duplicate bug report (1787843). > > from xenial with systemd-shim installed on xenial, ie. > quieras perder y actualizarla a 18-04. > parciales. Primero a 16 y luego a 18-04. > 18-04 tiene soporte para 10 años. > > Muchas gracias por la información. > > de nuevo, cual es tu consejo? > > > duplicate bug report (1787843). > > > the (now removed from the archive) systemd-shim / upstart. > > > systemd-shim/upstart packages in systemd package. > > > from xenial with systemd-shim installed on xenial, ie. Si claro, luego te dirá de pasar a la 18-04. > Vale la pena actualizarla? > > quieras perder y actualizarla a 18-04. > > parciales. Primero a 16 y luego a 18-04. > > 18-04 tiene soporte para 10 años. > > > Muchas gracias por la información. > > > de nuevo, cual es tu consejo? > > > > available. > > > > duplicate bug report (1787843). > > > > the (now removed from the archive) systemd-shim / upstart. > > > > systemd-shim/upstart packages in systemd package. > > > > from xenial with systemd-shim installed on xenial, ie. Si es un equipo moderno sin problemas. antiguos XCFE Xubuntu o LXDE Lubuntu. un Netbook con 1 Giga Lubuntu. > Si es un equipo moderno sin problemas. > antiguos XCFE Xubuntu o LXDE Lubuntu. > un Netbook con 1 Giga Lubuntu. > > Vale la pena actualizarla? > > > quieras perder y actualizarla a 18-04. > > > parciales. Primero a 16 y luego a 18-04. > > > 18-04 tiene soporte para 10 años. > > > > Muchas gracias por la información. > > > > de nuevo, cual es tu consejo? > > > > > available. > > > > > duplicate bug report (1787843). Looks like I can't install anything (or most things) until this gets fixed. Is there a consensus on the proper way to uninstall systemd-shim? creo que este hilo puede ayudarte. > fixed. Is there a consensus on the proper way to uninstall systemd-shim? Bueno, ninguna de las soluciones aquí está muy clara. Una de ellas es "sudo apt purge gdm etc."... "etc." que? Varios dicen "borrar"... borrar como? Tu dijiste: "I solved problem sttoping services and erasing systemd-shim upon console. After I could updating my pc, also, from console"... Qué servicios paraste, y como? Tengo que hacerlo en Safe Mode? 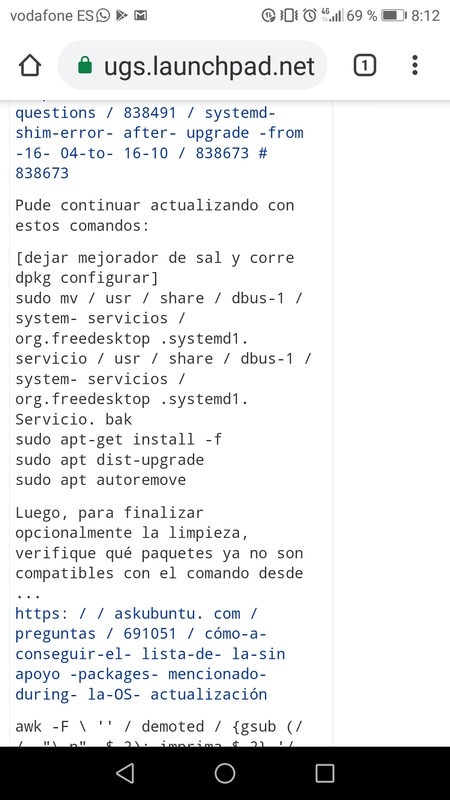 Uno de los últimos dice: "The upload of systemd that was purported to fix this bug report was superseded by a security update of systemd so the fix is no longer available." Así que por lo que se ve, esa solucion ya no sirve. A mi me funcionó correctamente, pero no lo almacené. Puede ser otro problema con el mismo resultado. > "sudo apt purge gdm etc."... "etc." que? > Varios dicen "borrar"... borrar como? > paraste, y como? Tengo que hacerlo en Safe Mode? It does not work in the opposite order! If you try that way, apt purge will complain about the service file.